Remind me never to do this again. Finish a tour, then hop on a plane and go somewhere else. You really need time to settle, take stock of what just happened, get your energy reserves back, and allow your soul to catch up to your corporeal body. In my case, my coughing got worse towards the end of the walk, and by the time I got to Assisi I was no fun to be around. I would get into a coughing fit which would be hard to stop. I just needed rest time. I didn’t get it. We headed straight to Rome, and then to an early flight to Turkey. Got off the plane, had 45 minutes rest at the hotel, then had to hop in a taxi to meet with the lovely lady who is organising our time here for the PGS film. Her name is Zeyno, and I will tell you more about her later. She runs a karmic healing centre in Istanbul, and uses past lives to find out what’s wrong with you, and how you can sort yourself out. Zeyno was introduced to us through Joni Patry, in Dallas – the Vedic Astrologer. Dallas continues to have resonances – and we’re not finished with Dallas yet, not by a long shot. Slept nine hours last night, dosed up with medicines from Marie (thank you Marie!) and woke this morning feeling half human. Which is better than the quarter human I’ve been feeling these past few days. Today will be a slow day. We have an interview lined up at about 3pm, and I want to scout some filming locations, in particular the Blue Mosque. The tour is starting to resonate. I need time to reflect on what we did. It was an intense and profound walk, amidst all the fun and laughter, because there was plenty of that. But the walk itself, its meaning, and some of the places we visited, will stay with me a very long time. I thought I would post this photo I took this morning at breakfast. 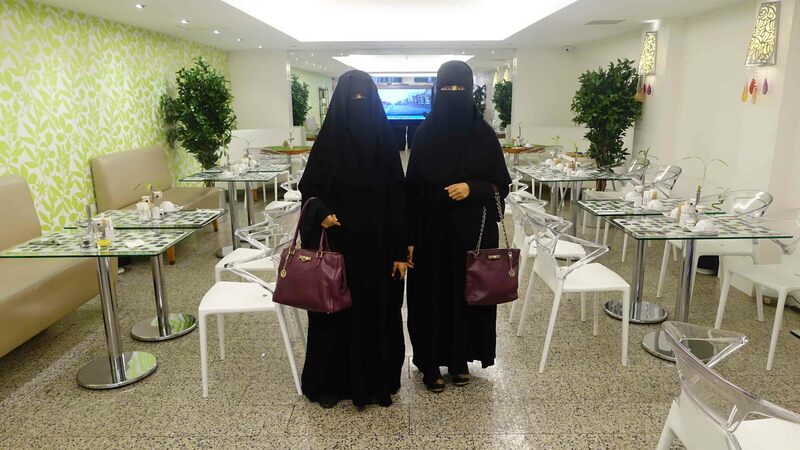 These two Muslim ladies came in, with their identical handbags. I asked them for a photo, and of course I wanted to position them a particular way. I made the mistake of touching one of them on the arm, to put her in position. It was like I’d touched her with a cattle prod. I’ll have to readjust to Middle Eastern mores. Best wishes for a wonderful time in Turkey Bill and Jen. I hope all your interviews go super well and that many insights are shared. It’s great to hear that you’re feeling better. Yes the next ten days should be interesting! Will post lots of pics! !